Today we reorganised our herb pot by clearing it out and adding some new plants, which are recommended for bees and other pollinators. Two of the plants, a sage called Nazareth and a lavender called Munstead we bought from the Cambridge University Botanic Garden on Saturday. I hope they help feed some hungry bees. We intend to add some thyme later. Talking of bees, I had two goes at the timed bee count on the Friends of the Earth’s current app on my tablet during the afternoon. They ask you to choose a flower and then count the bees you see visiting it for one minute. For my first attempt, I watched a viper’s bugloss and for the second, a foxglove. One bee visited each plant during the minute of counting! They were different types of bee, but you don’t have to give the species in that exercise. When the minute is up, an alarm sounds! This year’s count goes on until the end of the month. 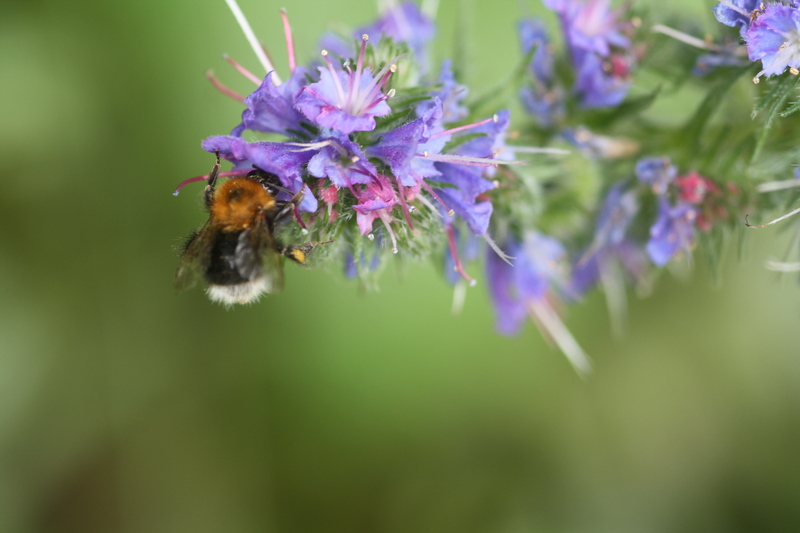 A tree bumblebee visiting viper’s bugloss. I haven’t tried a count like that before, but it was fun having a go. I’ll probably try it again when my tablet has recharged. I even had a go at photographing a bee with my tablet camera, thinking I would never manage to capture the insect. However, I was pleasantly surprised; although the pictures weren’t brilliant, you could see the bee reasonably well on some of them! There were several bees in the garden over the afternoon and some small hoverflies. 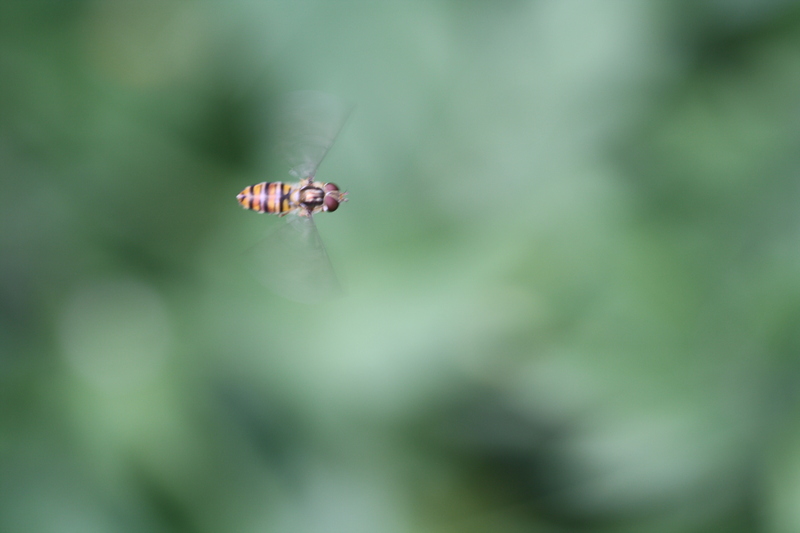 I was quite pleased with this – a hoverfly in flight. 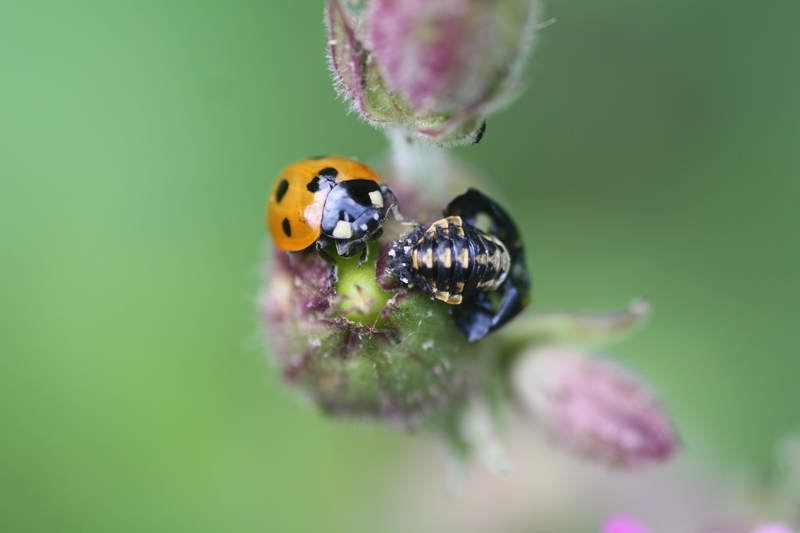 I also noticed a seven-spot ladybird right next to a ladybird pupa on top of a red campion plant. It looked as if the pupa had broken open but whether or not the ladybird had recently come out of it I don’t know as I’ve never seen one breaking free from its pupa. The ladybird was fully marked: I have a book which states that the basic adult pattern and colouration may take several hours or even days to develop after it comes out of the pupa. The ladybird is touching the pupa.